Home Business How to Organize Your Budget? How to Organize Your Budget? What are your financial goals, and are you meeting them right now? Whether you’re dodging creditors, trying to stretch a paycheck, or wondering how you’re going to put the kids through college, the first step is to organize your budget so that you can find out where you are now and make a plan for where you want to be. Creating a budget may sound daunting, but it’s really pretty easy. Here’s how you do it. The first thing you need to do is figure out how much cash is going out each month and how much is coming in. You’re going to make two worksheets. The first will be for your monthly fixed bills and income, the second for your yearly expenditures. Here’s what you need to do for the first sheet. Gather your monthly fixed bills—all of them—and put them in a pile. This is credit cards, loans, mortgages—anything you have to make payments to every month. Be sure you have the very latest statements, and weed out any duplicates. On a piece of paper, write down each payee on a separate line with the total amount owed next to it. Don’t just include minimum payments on your credit cards, but the entire balance. Include the entire balance of any loan you have as well, including a mortgage. If you’re not sure of the balances on your loans, call the lender and find out. Add this column to get your total amount of debt. Put this figure at the end of the column. Underneath the total, write down any other debts not represented by your monthly bills (for example, a loan from a friend of family member) and the amounts. Add the first total and these debts, and put that figure at the bottom. This is your total debt. 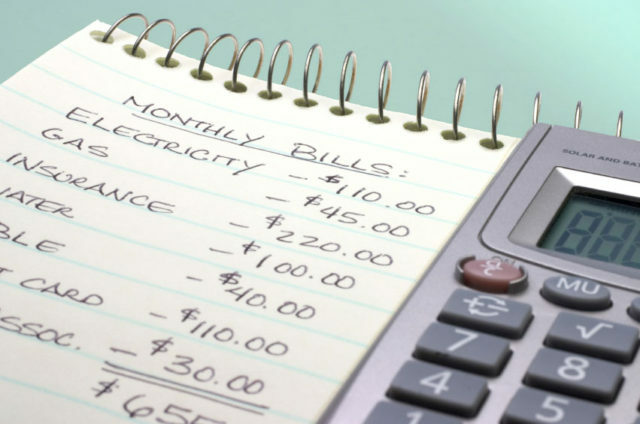 In the second column, write down the amounts of the fixed bills again, but this time, only include the minimum payments on your credit cards and your regular monthly loan and mortgage payments. Add this column. This is your monthly debt. You should have two figures now, one representing your total debt and the other representing your debt for the current month. If you’re behind on any payments, add those back payments to the second figure (the debt for the current month). In the third column, write down all of your assets, one per line, with the amount written next to it. Include bank account balances, cash, and any paychecks or other payments that haven’t yet been deposited, plus any investments, CDs, savings bonds, IRAs, 401(k) plans, life insurance policies, and the like. Add to the third column the estimated current value of you home, cars, and any other major asset, such as a boat, second home, or valuables. Do not include any bonuses or commissions that are not definite or that have not yet been earned. total these to get your total assets. Now you’re going to do a few asset calculations. First, do a calculation of only your liquid assets—all the cash you could easily lay your hands on without any penalties or fees. Now do another calculation, this time of your total yearly income. You can do a gross income statement or a net income statement. I prefer to use a gross figure and include in the budget all deductions that might come out of a paycheck (401[k], automatic savings, FICA [Federal Insurance Contributions Act], Social Security, etc.) on a budget. That way you see where all your money is coming from and where it’s going. The gross income system would also work best if you’re self-employed. Also, include in your year’s income statement any anticipated bonuses or commissions. Looking at your cash on hand and immediate monthly debt, you obviously need to have more in the plus column than the minus column. If that’s not the case, you need to look at some of your other assets and see what you can access to pay your bills for this month. If that’s not possible, you somehow have to generate enough cash to cover your bills. The second page of your budget will be a detailed spending grid which outlines all of your other operating expenses for the year. Housing, which should be broken down into the mortgage (or rent), maintenance, homeowner’s insurance, and utilities. Auto, which should be broken down into car payments, maintenance, fuel, and auto insurance. Medical and dental (include each member of the family), with a separate category for medical insurance. Clothing, broken down for each member of the family, including dry cleaning. Food, which includes both groceries and meals out (broken down separately). Interest on credit cards and other debt, as well as the regular monthly credit card (when you pay off the balance each month) and loan payments. Life and disability insurance payments. If these are already deducted from your paycheck, look at your pay stubs for the correct amounts and put them in the appropriate category. Taxes, including federal withholding, Social Security, and state income taxes. Make a separate category for real estate taxes. Entertainment, including cable or satellite TV bills and video rentals. Miscellaneous, which might include cash expenditures such as newspapers, cigarettes, and so on. Charitable contributions. Keep thorough records of your charitable giving. You just might find yourself eligible for a tax break based on your generosity. Savings, including any automatically deducted 401(k) savings plans. Across the top of the paper, put each month you’re going to be calculating and draw lines down to make a grid. Now write down the total you spent in each category during each month. Be consistent about putting expenses in the same category each time. Now calculate the monthly average for these categories. In some categories, you can make projections for the year just by multiplying the average by the number of months left in the year. Some categories may need to be adjusted, however, for seasonal variations. For instance, you may find most of your gift category spending is concentrated in the months before Christmas. So if you’ve calculated a 6-month picture that includes the holiday months, you probably don’t need to double that amount to get a 12-month projection. You might only need to add another third or less of that figure for the remaining 6 months of the year. Add all your expenses from both pages for a grand total, and as a final part of the process, compare your expenditures with your total income. Now that you have a clear idea of how much money you have coming in and how (and where) the money is going out, you can develop a budget. Transfer your categories to another sheet and then transfer the fixed expenses. Next, decide on cost-control measures and come up with realistic figures you can adhere to each month for variable expenses, and put down those amounts on your budget sheet. From there it’s just a matter of sticking to the budget you have made for yourself. Next articleHow to Find Freelance Job & Bid on Freelancing Project?